The Euros have only just seen their second day come to an end and already there are lessons to be learnt. Denmark's victory over the Netherlands was an almost perfect display of good positioning, clear ideas on how to shift the ball from side to side and looking for the open space. Furthermore, both Daniel Agger and Simon Kjaer were almost faultless at the back. The situation below shows how good defensive coverage is critical, particularly against such strong players in 1v1 situations such as the Dutch. 1. Afellay takes on the Danish right-back Jacobsen. Notice Kjaer's positioning (yellow). From where he is, he can both keep an eye on the striker lurking behind him and cover for Jacbosen, in case Afellay gets by him. 2. Afellay gets by Jacobsen. The Dutch winger manages to dribble the Danish right-back. The moment he realises that, Kjaer immediately goes to his team-mate's help, creating a 2v1 situation and frustrating Afellay. 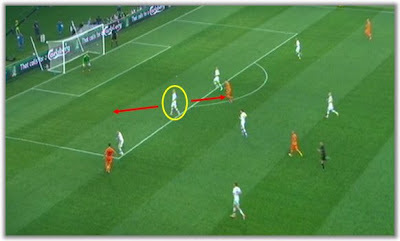 Notice where the positioning of the closest Dutch players. 3. Kjaer tackes Afellay. The Danish centre-back wins the ball back from Afellay. Notice how poor attacking coverage means that Kjaer has lots of time to think whom he is passing the ball to. Even though these seem isolated situations, good defensive drilling and positioning may represent the difference between a 1-0 win, a draw or a defeat. When accompanied by a clear notion of where the ball should travel to in the few seconds afterwards, the whole team's task suddenly becomes much easier.